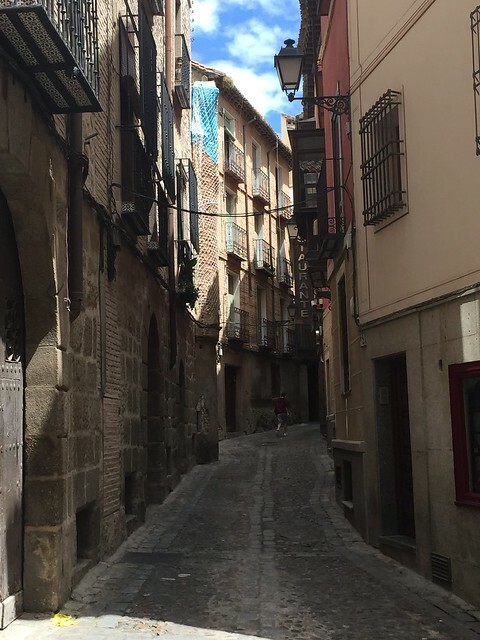 What to do in Toledo Spain for a day? What is the best Toledo day trip itinerary? In this post, I answer this questions with a Toledo day trip itinerary including the top things to see in Toledo and tips and advice for cultural travellers of all ages. One of the most pleasant and easy day trips from Madrid is a visit to the stunning city of Toledo. What is Toledo best known for? How many hours in Toledo? How to get to Toledo from Madrid? 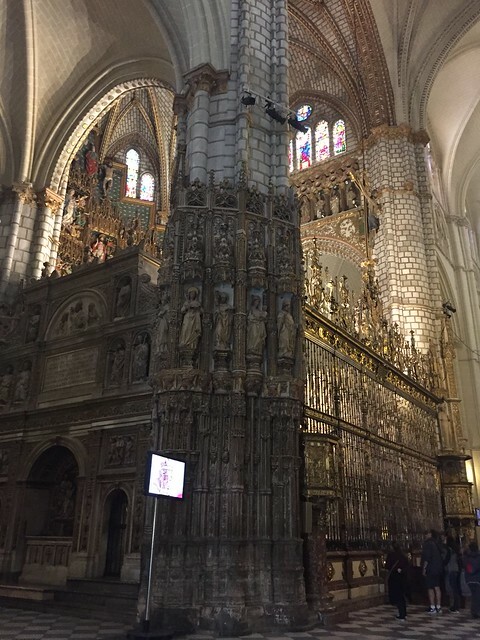 Day trip Madrid to Toledo: What to see in Toledo Spain in one day? One day in Toledo for kids: is Toledo kid-friendly? Final considerations: is a trip to Toledo worth it? Toledo is a historical city in the centre of Spain famous for its important past and now famous as one of the mos visites UNESCO World Heritage sites in the whole of Spain. Toledo has a long history that saw this small roman town first become the capital of the Visigoths Kingdom, then a fortress of the Emirate of Cordoba, an outpost of the Christian kingdoms fighting the Moors and, in the 16th century, the capital of the Spanish Empire. Its long history dotted its cobbled lanes with architectural jewels and strolling through it makes for a pleasant an interesting day of historical discovery that will bring you from Roman times to the dawn of the Modern era. The main attractions in Toledo are its impressive Alcazar, its many churches and its old streets. 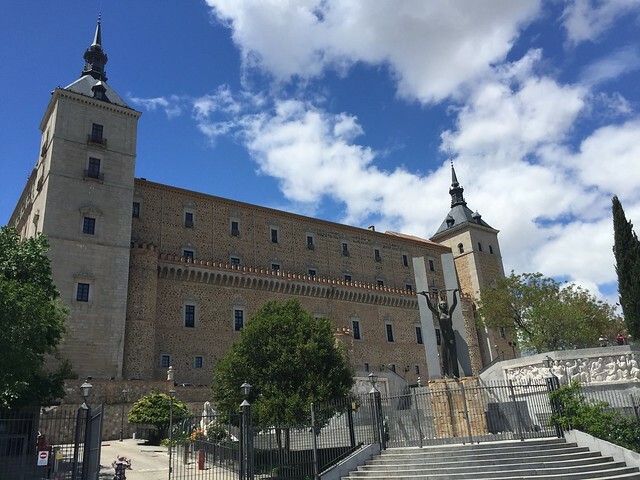 They are a treat for history lovers but also a great day out for food lovers and for anyone interested in leaving behind the busy streets of Madrid for a day. With Segovia, Toledo is usually described as one of the best day trips from Madrid. Indeed, while additional time would allow you a more in depth visit, I believe a full day here will be enough to see most of the city and get a good sense of the place. I recommend you plan a full day here,morning to evening if you intend to visit some of the attractions such as the Alcazar or some of the churches inside. Please be advised that Toledo is very popular and especially in the good season, the crowds can be overwhelming. Especially for meals, I recommend to plan stops either early or late so you don’t have to content with the other tourists for a table! Disclaimer. Please note: this post contains affiliate links and if you make a purchase through them, we might make a small commission at no extra cost to you. The best way to get to Toledo from Madrid is by train. The two cities are connected by frequent and efficient trains departing from Madrid Puerta de Atocha station. Tickets can be bought on the day from the main ticket office inside the station and seat reservation is compulsory. Booking tip: especially at the weekends, Toledo is very popular with day-trippers and trains fill up fast. Tourists tend to leave the city in the late afternoon with the 5 pm train, so if you book a slightly later one you see a calmer, more authentic side of the city. To get from Madrid to Toledo by train is easy:frequent trains connect Madrid Puerta de Atocha to Toledo and tickets can be bough both online on the renfe website or at the station. The trip takes about 35-40 minutes and the trains are clean and well kept. Toledo is perched on a hill and the train station is right at its bottom. The walk to the town centre is not long (about ten minutes) but it gets steep and it is better avoided with your children or if carrying luggage. A better option is a short bus ride up (from in front of the train station) or a taxi: it will only set you back about 5 Euro and will leave you right beside the Alcazar, the buzzing town centre. Toledo’s hilltop location means that car access is strictly regulated and, overall, hard. Parking places are located outside the city centre and tend to fill up fast: if you can, try to reach the city early in the morning to claim your spot. Several companies organise transfer or fully fledged guided day trips from Madrid to Toledo. These are some of the tours on offer, selected by the number of positive reviews received on the specialized site GetYourGuide. Many companies offer organised day trips from Madrid to Toledo, but if you prefer ta visit at your own pace, I found independent travel between the two cities easy. You can get detailed maps of Toledo in the train station on arrival (2 Euro per map) and all attractions are well signposted and have good information panels in Spanish and English. Size-wise, Toledo is small and it is possible to walk from one side of the town to the other in a matter of minutes. Despite this, the concentration of buildings and attractions is so high, one full day in the city will be just about enough to feel you have explored the town and it is likely to leave you wanting for more. 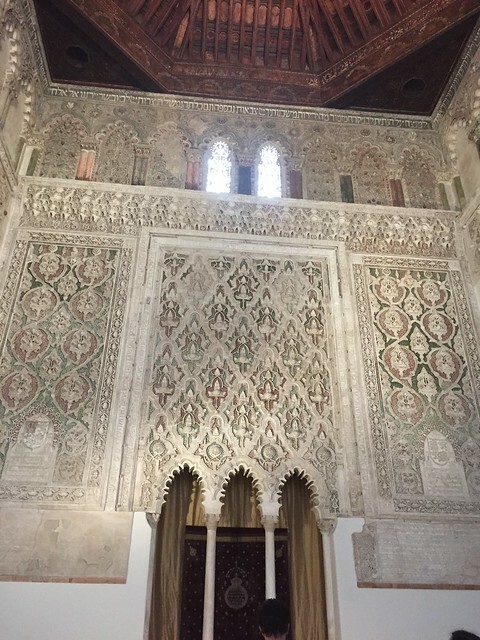 The first building you see on arrival and the one that dominates the surrounding countryside is the Toledo Alcazar (the fortress), a stunning building, with a peculiar architecture mixing Moorish and Christian motives. It dates back to Roman times (III century A.D.) but was subsequently rebuilt and extended until in the XVI century acquired its current facade. Over the course of the centuries, the Alcazar worked as a palace and a fortress and was at the centre historically significant sieges: latest and most famous is the one that happened in 1936, during the Spanish civil war, when the Nationalists manage to keep hold of it for over two months, despite the attacks of the republican artillery. Nowadays it works as an interesting museum of the armed forces. Toledo’s Alcazar: the fortress dominates the surrounding countryside and has a peculiar architecture that mixes Moorish and Christian elements. This is possibly the building in Toledo that made the strongest impression on me, because of its peculiar aesthetics and history. It is allegedly the oldest Synagogues in Spain, where the Jews are believed to have arrived in the I century A.D. right after the destruction of the temple in Jerusalem by the Roman army. It was built by Islamic architects for the use of the Jewish community under the Christian Kingdom of Castilla in 1880. It is an incredible example of the cooperation that existed between the three communities during the Middle Ages and nowadays it is owned and preserved by the Catholic church. 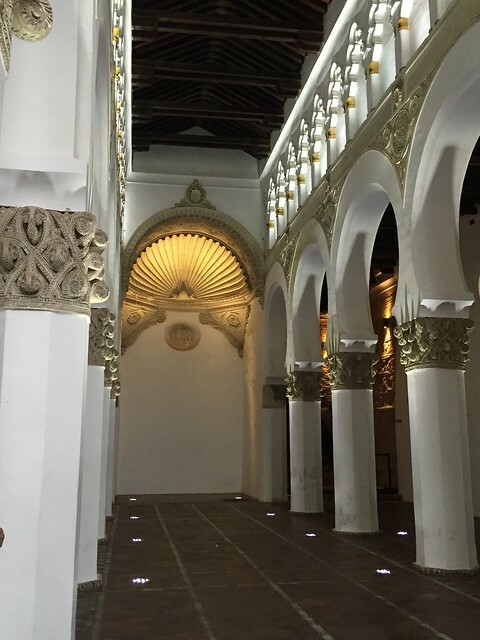 Santa Maria la Blanca is a beautiful building, with an unmistakable Moorish flair in terms of architecture. Its most distinctive trait is the colour of its inside, echoed in the name of the building. Its many columns and arches are entirely white, with only golden coloured decorations on the capitals. Another incredible building located in the Jewish part of Toledo town is the Sinagoga del Transito, nowadays a museum. The Synagogue was built in 1356 and it is one of those buildings that seem designed to surprise the visitor. Its outside is severe and not overly ornate (except great detailing around the window frames) while the inside has intricate stucco artwork that will leave you in awe. The Synagogue has a main prayer hall and, beside it, the Sefardi museum, telling the story of the Jewish community in Spain. Access to both the Synagogue and the museum is free and a visit is not to be missed. Toledo has a wonderful, grand cathedral, built in the Gothic style and considered one of the greatest Gothic structures in the whole of Europe. 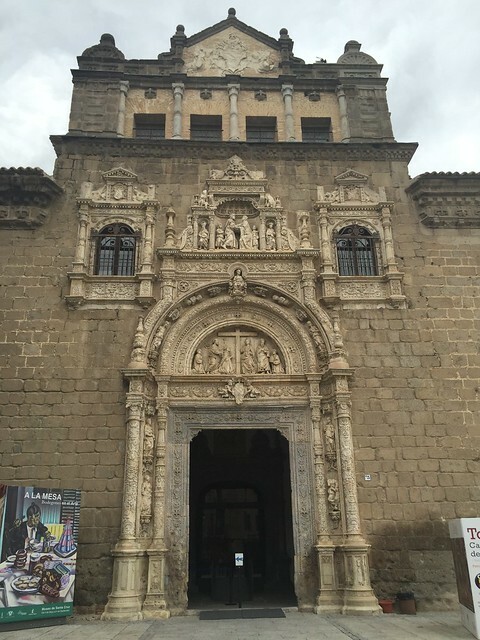 Its facade is impressive, but it is its interior that really steals the show with an incredible baroque altar and two paintings by El Greco. Make sure you enter from the main door to access the area of the building open to tourists. The construction of Toledo’s cathedral happened over the course of many centuries. The building originally erected in this location, in the VI century, was a Visigoth church then turned into a Mosque and took the shape we now see only in 1227. The cathedral is surrounded by narrow streets and despite its size and importance is not immediately visible to the passers- by: small street and building somehow obscure its facade, but this only adds to the jaw-dropping effect the visitor experiences once stepping in. Toledo’s cathedral is 120 m long, 60 m wide; it contains 5 naves supported by 88 pillars and counts 72 vaults as well as being home to one of the most elaborate choirs in Europe! 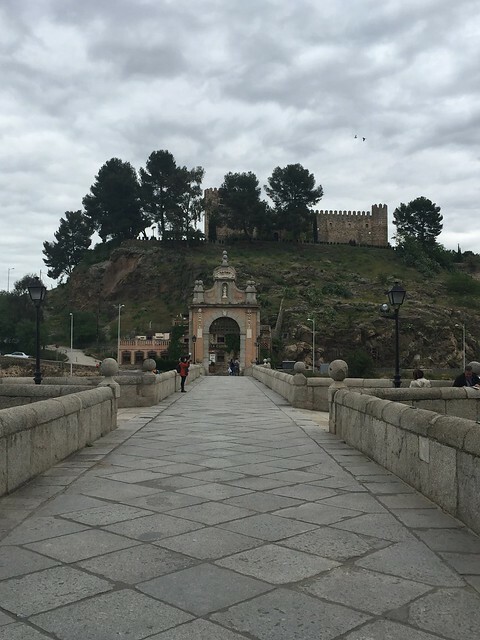 Originally built by the Romans, the Alcantara bridge is one of the entrances to the city of Toledo. It crosses the river Tejo (incidentally, the longest river in the Hiberica peninsula, it goes all the way to Lisbon!) and it is in a really impressive location, crossing the gorge of Toledo’s hill. The bridge and the river can be reached on foot from the city centre, following the ancient steps climbing down the hill slope and it is a vantage point for a view of the city. From it, you get a beautiful view over the Alcazar from the bottom up: standing on the far end of the bridge, you get a full understanding of how powerful the Alcazar must have been as a fortress to defend the city! The ones outlined so far are only a small selections of things to see in Toledo as this small medieval town has architectural treasures at almost every corner. Churches, belvedere terraces, courtyards and museums (including the famous El Greco museum) are everywhere and the compact size of the city means that with a long walk you will be able to touch on all its main sights. Toledo has fabulously ornate churches at every corner! Buggies and strollers: I noticed many buggies and strollers in the city, but the cobbled streets, the many steps and the crowds are a recipe for parents’ exhaustion! If you have a baby or a toddler, a carrier is a better option. If you are considering getting a lightweight stroller just for travel, here you find a selection of our favourites. While I did notice a small playground, the city is very much a cultural stop. If your children are not yet at an age when they can get interested in the history of sieges, war and art, you might find boredom will set in quickly. Slightly older children, on the other hand, might really enjoy the army museums and the many shops selling knick-knacks and Spanish costumes. When in the city, pay particular attentions to the cars. Despite the small streets, not all the city is pedestrianised and it’s easy to feel a false sense of safety: cars abound! The narrow, medieval streets of Toledo make for a bumpy ride on a buggy! So, is Toledo worth a day trip from Madrid? In my opinion, absolutely yes! Toledo is stunning and very particular as it mixes a type of Christian medieval architecture with some Moorish motives that are peculiar of Spain and not usually found in other parts of Europe. If you go to Toledo, be aware that there will be many tourists following the same itinerary and schedule as you, so prepare yourself for visiting as part of a crowd but don’t let it ruin your experience. As it is often the case, Toledo is popular for a reason and this reason, I believe, shines through even the most crowded day. Will you add one day in Toledo to your Spain travel plan? I hope you do and if so, I’d love if you could come back here and leave a comment with your favourite spot!